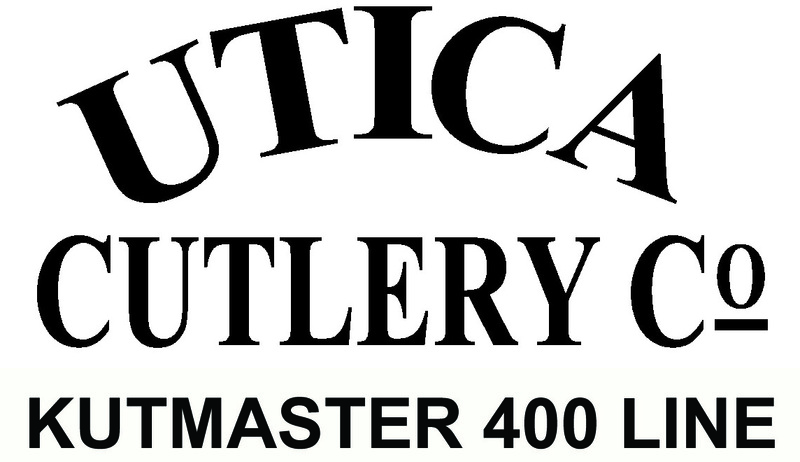 Utica Cutlery is the owner of the information collected on the Utica Cutlery web sites. Utica Cutlery may collect information from “users” (visitors) to the web sites at different places on the Utica Cutlery web sites in order to provide services to the users and to improve such services. During registration a user may be required to provide contact information (such as name, mailing address, telephone numbers, and email address). Utica Cutlery uses this information to maintain contact with the user as is necessary. Users must also provide financial information (such as credit card number, expiration date) when applying for Utica Cutlery service. This information is used for billing and payment purposes. In the event Utica Cutlery has trouble processing an order, that information is used to contact the user. Utica Cutlery may collect and store information from cookies, log files, clear gifs, and/or third parties to create a user’s profile. A ‘profile’ is stored information that Utica Cutlery maintains on individual users that details their viewing preferences. Consequently, collected information may be tied to the user’s personally identifiable information to provide offers and improve the content of the site for the user. This profile is used to tailor a user’s visit to the web sites, and to direct pertinent marketing promotions to them. A cookie is a piece of data stored on a user’s computer used to connect to information about the user on the service. Utica Cutlery may use both session ID cookies and persistent cookies. For the session ID cookie, once users close the browser, the cookie is removed. A persistent cookie is a small text file stored on the user’s hard drive for an extended period of time. If desired, persistent cookies can manually be removed by following your web browser help directions. By setting a cookie on a user’s computer, users do not have to log in a password more than once, thereby saving time while at the web sites. If a user rejects the cookie, the user will still be able to use the site. The only drawback to this is that the user may need to enter his or her password every time he or she accesses the site. As is the standard with web site servers, Utica Cutlery’s web sites use log files. This may include computer (IP) addresses, browser types, referring/exit pages, platform type, date/time stamp, and number of clicks to analyze trends, administer the site, track user’s movement in the aggregate, and gather broad demographic information for aggregate use. IP addresses, etc. are not linked to personally identifiable information. IP addresses may be tied to personally identifiable information to enable web-based services. To manage user accounts and for other purposes, we may use tracking tools and utilities such as grep, traceroute, host, nslookup, or others. Utica Cutlery may employ a software technology called web beacons (web bugs or clear gifs), that help it to better manage content on the web sites by informing it what content is effective. Clear gifs are tiny graphics with a unique identifier, similar in function to cookies, and are used to track the online movements of users. The main difference between the two is that clear gifs are invisible on the page and are much smaller, about the size of the period at the end of this sentence. Clear gifs are not tied to users’ personally identifiable information. Business clients and users may not utilize Utica Cutlery’s services or tools to send unsolicited bulk e-mail or other forms of unsolicited bulk communications. Similarly, clients/users may not authorize others to use their accounts or e-mail addresses assigned to those accounts to send unsolicited bulk e-mails or communications, or cause unsolicited bulk communications to be sent by some other individual or party. Clients/Users may not harvest or collect information about Utica Cutlery users, including e-mail addresses, and use that information for the purpose of sending unsolicited bulk communications. Any violation of these provisions may result in immediate termination of a business client’s Account (including all of its related user accounts) and further legal action. The Utica Cutlery user agreement also states that Utica Cutlery may take any legal and technical remedies to prevent unsolicited mailings. Utica Cutlery DOES NOT Share Personal Information about users with any Third Parties except to provide services requested by our Users. Though Utica Cutlery makes every effort to preserve user privacy, Utica Cutlery may need to disclose personal information when required by law when it has a good-faith belief that such action is necessary to comply with a current judicial proceeding, a court order or legal process served on Utica Cutlery. Utica Cutlery may share aggregated demographic information with partners or advertisers. This is not linked to any personally identifiable information. Utica Cutlery may partner with third parties to provide specific services used by our Users. In such event, Utica Cutlery may share names or other contact information with such parties so that they may provide services such as technical support to users. Third parties are not allowed to use personally identifiable information except for the purpose of providing these services. Utica Cutlery’s web sites may contain links to other sites. Please be aware that Utica Cutlery is not responsible for the privacy practices of such other sites. We encourage users to be aware when they leave our site and to read the privacy statements of each and every web site that collects personally identifiable information. This privacy statement applies solely to information collected by Utica Cutlery’s web sites. Utica Cutlery takes every precaution to protect all users’ information. When users submit sensitive information via Utica Cutlery’s web sites, their information is protected both online and off-line. When the User End User Agreement or other online forms ask users to enter sensitive information (such as credit card number and/or social security number), that information is encrypted and is protected with the best encryption software in the industry – SSL. While on a secure page, such as the User End User Agreement and online order forms, the lock icon either on the bottom or top of web browsers such as Apple Safari, Mozilla Firefox and Microsoft Internet Explorer becomes locked, as opposed to un-locked, or open, when users are just ‘surfing’. While Utica Cutlery uses SSL encryption to protect sensitive information online, the Company also does everything in our power to protect user information off-line. All user information, not just the sensitive information mentioned above, is restricted in Utica Cutlery’s offices. Only employees who need the information to perform a specific job are granted access to personally identifiable information. ALL employees are kept up-to-date on Company security and privacy practices. Finally, the servers that store personally identifiable information are in a secure environment. Utica Cutlery may send new users a welcoming email to verify password, username, and acceptance of the Subscription/User Agreement. Users may occasionally receive information on products, services, special deals, and the like offered by Utica Cutlery. On rare occasions it is necessary to send out a strictly service related announcement. For instance, if our service is temporarily suspended for maintenance Utica Cutlery may send an email notifying Users of the outage. Generally, Users may not opt-out of these communications, though they can deactivate their account. These communications are not promotional in nature. Utica Cutlery communicates with Users via email, regular mail and telephone on a regular basis to provide requested services and regarding issues related to User’s services.